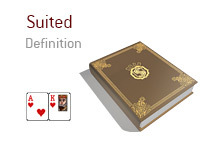 What does the term "suited" mean in poker? What is meant by the term "suited"? In poker, the term "suited" refers to when you are dealt two cards of the same suit in games in which you are dealt two "hole cards" pre-flop. You are dealt Ah-Kh in the Big Blind. Action folds around to the button, who puts in a standard pre-flop raise. The SB folds, you re-raise and the button folds. Your A-K in this hand was made even stronger by the fact that it was "suited", which obviously increases the possibility that you will end up with a flush in the hand. You are currently involved in a hand with one other player. The board currently reads 3s-5s-As-Kh-Qh. Your opponent leads out with a bet and you call. You flip over A-A for a set of Aces, while your opponent flips over 4s-6s. Your opponent started out with 4-6 "suited" and flopped a flush. You flopped a set of Aces and just couldn't get away from the hand.